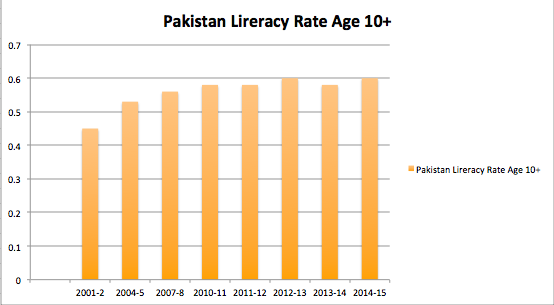 Data shows that Pakistan's literacy and enrollment rates are not rising in spite of significantly increased education spending over the last several years. Education budgets at federal and provincial levels have seen double digit increase of 17.5% a year on average since 2010. And yet, school enrollment and literacy rate have remained essentially flat during this period. This lack of progress in education stands in sharp contrast to the significant improvements in outcomes seen from increase education spending during Musharraf years in 2001-2008. Why is it? Human development index reports on Pakistan released by UNDP confirm the ESP 2015 human development trends.Pakistan’s HDI value for 2013 is 0.537— which is in the low human development category—positioning the country at 146 out of 187 countries and territories. 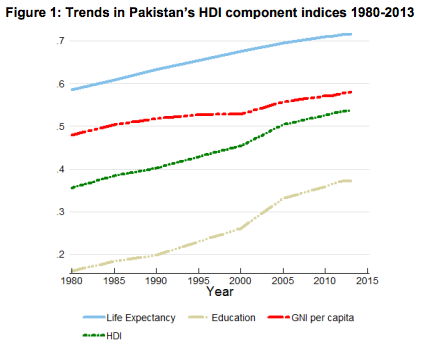 Between 1980 and 2013, Pakistan’s HDI value increased from 0.356 to 0.537, an increase of 50.7 percent or an average annual increase of about 1.25. In 2014, Sindh's provincial education minister Nisar Ahmed Khuhro said that "a large number of fake appointments were made in the education department during the previous tenure of the PPP government" when the ministry was headed by Khuhru's predecessor PPP's Peer Mazhar ul Haq. Khuhro was quoted by Dawn newspaper as saying that "a large number of bogus appointments of teaching and non-teaching staff had been made beyond the sanctioned strength" and without completing legal formalities as laid down in the recruitment rules by former directors of school education Karachi in connivance with district officers during 2012–13. A 2013 study conducted in public schools in Bhawalnagar district of Punjab found that 27.5% of the teachers are absent from classrooms from 1 to 5 days a month while 3.75% are absent more than 10 days a month. The absentee rate in the district's private schools was significantly lower. Another study by an NGO Alif Ailan conducted in Gujaranwala and Narowal reported that "teacher absenteeism has been one of the key impediments to an effective and working education apparatus." "...every time a new political government comes in they have to distribute huge amounts of state money and jobs as rewards to politicians who have supported them, and short term populist measures to try to convince the people that their election promises meant something, which leaves nothing for long-term development. As far as development is concerned, our system has all the worst features of oligarchy and democracy put together." Education spending in Pakistan has increased at an annual average rate of 17.5% since 2010. However, the school enrollment and literacy rates have remained flat and the human development indices are stuck in neutral. This is in sharp contrast to the significant improvements in outcomes from increased education spending seen during Musharraf years in 2001-2008. An examination of the causes shows that the corrupt system of political patronage tops the list. This system jeopardizes the future of the country by producing ghost teacher, ghost schools and absentee staff to siphon off the money allocated for children's education. Who's Better For Pakistan's Human Development? Musharraf or Politicians? There is enough bad news. You're suppose to write only good things about Pakistan and bad things about others like India. Pakistan's increase in education spending barely covers the nearly 10% core inflation rate over the period in your blog. Over the last 7 years, real estate costs have quadrupled, so new schools are costlier to build. CPI is out of control - food, transportation, housing, and healthcare costs have nearly quadrupled as well. Salaries had to match. In contrast, the education budget has only doubled. Using "corruption factor of Sindh" as a constant, it is suprising that the enrollment has stayed level in that province. Basic math. Shams: " CPI is out of control - food, transportation, housing, and healthcare costs have nearly quadrupled as well. Salaries had to match.......Basic math." Core Inflation Rate in Pakistan increased 5.50 percent in May of 2017 over the same month in the previous year. Core Inflation Rate in Pakistan averaged 7.69 percent from 2010 until 2017, reaching an all time high of 11.40 percent in June of 2012 and a record low of 3.40 percent in September of 2015. Even if one accepts your exaggerated 10% annual inflation figure, since when is 17.5% annual education budget increase less than 10%? The numbers 17.5% and 10% suggest that the "additional" spending is not as additional as your blog makes it sound. The second part of my comment on your blog was that the entire spending increase is in the Punjab where new universities have been set up and new funding has been provided to existing universities. Shams: "The numbers 17.5% and 10% suggest that the "additional" spending is not as additional as your blog makes it sound. The second part of my comment on your blog was that the entire spending increase is in the Punjab..."
It's obvious you know nothing about how education is funded and managed in Pakistan after the adoption of the 18th amendment. At the K-12 level, it's entirely in the provincial budget. 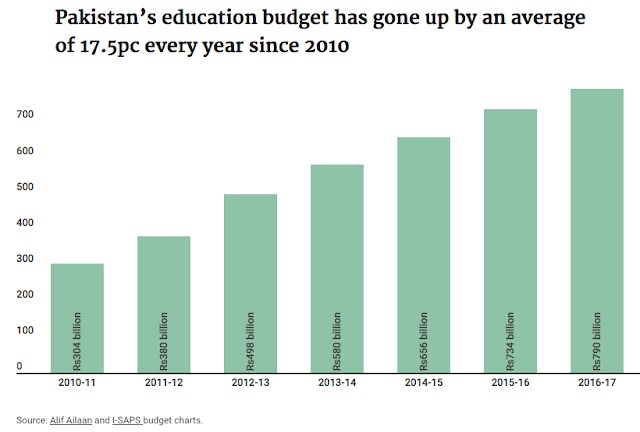 All of the provinces, including Sindh and Balochistan, have seen big increases in education budget but no improvement in enrollment or literacy rates mainly due to widespread corruption and mismanagement. I have cited examples of mea culpa by Sindh and Balochistan politicians in my post. As to inflation, the core inflation rate in Pakistan since 2010 has been 7.69% while the budget increases have averaged 17.5%. Pakistan dares to reject anything Indian. Here is the Indian Model for Pakistan to try. From UNESCO standpoint, India also has numerous challenges including ghost teachers. What the government did, and now the Modi Team has spear headed, was to make education and literacy a birthright and then made providing at least one full meal at school mandatory. Two things happened next. Enrollment increased among poor households (low literate group) and problem of teacher absenteeism started vanishing simply because the manpower and monitoring required and the parents would complain if their children were not fed! The Lady Reading Hospital, a public sector medical teaching institution of the provincial capital, is taking measures to fully apply the Radio Frequency Identification technology introduced three months ago to ensure the attendance of staff members and effective patient care. According to the officials in the know, the data of the RFID cards issued to the hospital’s 3,500 employees are being connected to the payment of salary to them. They told Dawn that the employees won’t be paid salary for their absence from duty without permission. Initially, the 1,749-bed hospital had introduced biometric system for attendance of staff members but that didn’t achieve the desired results as senior consultants didn’t approve of affixation of thumb to the machine at the time of entry to and exit from the premises considering the act a ‘disgrace’. However, the new system is gaining currency as the administration is hopeful that the employees are required to show up the card before a screen without requiring them to affix thumb impression on the biometric devices fixed at certain places. The officials said the authorities found it extremely challenging to regulate the attendance of staff members at the facility due to the visit of 6,000 patients to OPD and 4,000 to accident and emergency department and therefore, it had sought assistance from the Shaukat Khanum Memorial Cancer Hospital and Research Centre for the application of the latest technology on the premises spread over 224 kanals of land. They said the hospital, the city’s oldest and largest health facility in the public sector, offered treatment in 27 specialties, the biggest number in any hospital of Khyber Pakhtunkhwa, recently closed unnecessary gates to reduce the massive influx of irrelevant visitors and ensure uninterrupted treatment of patients. When contacted, associate hospital director Mohammad Tariq said the management was in the process of applying information technology to the hospital affairs for which preparations were under way. “The patients will benefit from the new technology, which will enable them to get speedy investigations, while their results will be displayed on the screens of the computers of the relevant doctors,” he said. The assistant director said each patient would be issued a card useable everywhere in the province. “At a later stage, all data will be shared with the director-general (health services) and if the patients visit other hospitals, they will be able to find their whole records there with the help of the card,” he said. Mr Tariq said the patients wouldn’t be required to walk with a bundle of investigations and X-ray films as all that information could be seen from their cards. “In this way, we will save X-ray materials. The CT and MRI scans will also be seen using the cards,” he said. The assistant director said the new system would help the management know about the bed occupancy and location and ensure prompt admission after arrival of patients. “Though already there in developed countries for years, the integrated technology is a new thing to Pakistan. It ensures efficiency, effectiveness and promptness. More than 60 per cent work on its application has been completed,” he said. Mr Tariq said the enterprise resource planning was another mechanism the hospital was going to introduce to ensure the optimal utilisation of medicines and other materials. “When all data is available, we can make evidence-based planning,” he said. The assistant director said the new technology would enable the hospital to know about number of patients, their diseases, requirements of beds, doctors, nurses, paramedics and other staff members. Hospital director Dr Khalid Masud said the Medical Teaching Institutions Reform Act, 2015, had paved the way for improvement as the hospital was able to take decisions on its own. Here is a snapshot of PML-N’s economic policies in numbers. On top of these new taxation measures, the government has been withholding refunds of businesses of around Rs150bn to Rs200bn while collecting advance tax to bolster its revenue performance under the IMF programme. Measures such as the foregoing in particular, including the levying of sales tax of up to 52pc on high speed diesel, a main stay input for the entire economy, have been particularly damaging for industry. In terms of borrowing, the government’s debt-accumulation since 2013 has pushed up total public debt from nearly Rs14.5 trillion in FY13 to around Rs21.5tr by June 2017 — adding Rs7tr in just four years. More worryingly, the PML-N government has contracted new foreign loans of nearly $40bn in four years, an unprecedented amount, pushing total public external debt outstanding in net terms (after repayments), from $51bn in June 2013 to $62bn at the end of March 2017. Under the third leg of economic policy under Mr Dar, the exchange rate has appreciated 26pc in real effective terms since December 2013 — hurting exports while giving a boost to all manner of imports including non-essential consumer and luxury items. In addition, the overvalued exchange rate has acted as a spur to capital flight from the country. A combination of unaddressed structural challenges from the past, and Mr Dar’s policy framework since 2013, has resulted in Pakistan’s export sector (manufactured goods) shrinking to 6.9pc of GDP from around 14pc in the mid-2000s. So the first order of business for the new PML-N prime minister should be to undo the punishing taxation burden on industry imposed by Mr Dar’s policies, and to rectify the policy framework in ways that will boost industry, in particular exports, in the long run. With Pakistan no more sleepwalking into a balance of payments crisis but sliding into one (even with international oil prices at around $50! ), the government’s policy space and options are becoming limited. It, or its successor, will need to begin talking to the IMF for a new loan programme sooner rather than later, which will curtail freedom of movement for introducing industry- and investment-friendly policies. However, some immediate concrete policy measures to reduce the cost of doing business in the country (on the taxation side), combined with a strong signal that the PML-N government is moving away from Mr Dar’s damaging economic policies, will be welcome as well as hopeful news for Pakistani industry. Tailpiece: Thank God for the PPP government in Sindh! In a huge service to real democracy, its uninterrupted misrule since 2008 has buried some apologetic myths forwarded since the July 28 Supreme Court ruling to ‘defend’ the pathetic non-performance of political governments. With the military commanding the heights in foreign and security policy, and not in terms of economic governance, it cannot be blamed if Thari children die each year due to lack of medicines in public hospitals, or if roads in Larkana are in a shambles, or there are heaps of uncollected garbage in Karachi. With around Rs2,100bn transferred to Sindh from the centre since 2013 under the National Finance Commission awards, in addition to the nearly Rs200bn tax collected by Sindh itself over this period, the issue is not even of money. It boils down to corruption pure and simple. Large-scale, pervasive and systemic corruption has been widely documented as the undoing of many resource-rich but underdeveloped countries, particularly in Africa, which have no civil-military imbalances to worry about. Regular, ongoing attempts to shift the blame from bad governance and grand corruption (political sleaze) to tensions in civil-military relations are disingenuous as well as a disservice. The United Kingdom strongly supports ASER, this is the only citizen-led independent assessment of Education and it is also an important tool for citizen’s accountability. We as DFID have been supporting ASER since its launch years ago, and we will continue to support the cause for better of the society, said Joanna Reid while addressing the panelists. The number of out-of-the-school children has dropped significantly from 25 million to 22 million according to the government data. However, it’s still not enough, there is a lot more to be done. We should not compromise on access to schools, our main focus should be on improving quality, the education budget was increased this year which is a good sign towards development but still short in achieving targets, from 2.83% of GDP the budget allocation this year was 3.02%, Joanna added. Education and economic development are correlated with each other, economic growth in Pakistan heavily relies on education, Pakistan has a larger segment of population which is aged between 10 to 24 years according to population Council, 61 million young people can really make a difference if they are equipped with required education and skills, if half of them are not, Pakistan will not be able to meet its workforce needs in the future to continue economic growth, she said. The ASER meeting was organized by Idra-e-Taleem-o-Agahi with other partners of ASER in Serena Hotel. Key personalities from Federal government Education department, National Assembly, Pakistan Institute of Development Economics and Human Rights Activists were among the Panelists. What’s Really Keeping Pakistan’s Children Out of School? Since 2010, Pakistan has more than doubled what it budgets for education, from $3.5 billion to $8.6 billion a year. The budget for education now rivals the official $8.7 billion military budget. The teaching force is as big as the armed forces. But Pakistan has a learning crisis that afflicts its schoolchildren despite much debate and increase in funding for education because policy interventions by the government and foreign donors misdiagnosed what is keeping children out of school. ...... the demand for education is already high, evidenced by the mushrooming of low-cost private schools that now enroll 40 percent of students in the country and charge as little as $2 a month. Foreign donors also want Pakistanis to send their girls to schools, but a 2014 Pew survey found that 86 percent of Pakistanis believe that education is equally important for boys and girls, while another 5 percent said it was more important for girls. Even in the northwestern province of Khyber Pakhtunkhwa — where Malala Yousafzai is from — government high schools for girls are enrolled beyond their capacity. Pakistan’s education crisis is a supply-side problem. 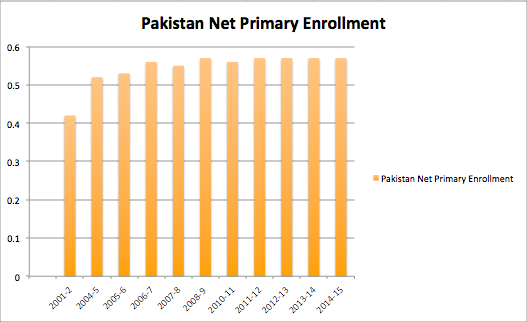 Enrollment rates are used as the measure for progress because Pakistan has the second-largest population of out-of-school children in the world. But the proportion of 5- to 9-year-olds in school is the same as it was in 2010: 57 percent. With teachers chronically absent from school at a rate of 20 to 30 percent and most of the education budget going into their above-market salaries ($150 to $1,000 a month), doubling the budget was never the solution to Pakistan’s education crisis. Eighteen million of the 23 million out-of-school children in Pakistan are between 10 and 16 years old. Efforts to reach them have been negligible. These children opted out of a failing education system and now they have aged. They will not now go to school if it means starting in kindergarten. They need accelerated programs, or short crash courses in literacy and math to help them enroll with their age group. Even if these children do not go back to school — international evidence suggests they won’t — they will, at least, become literate adults. Is our education sector ready for the future challenges? Despite the fact that Bangladesh made considerable progress in gross-enrolment in primary education for both genders, the country is seriously lagging behind in ensuring quality education for all. Because data for many of the targets related to Goal 4 are not available, we have studied a few available indicators which are consistent with the goal 4. If we consider the average years of schooling as an indication of the status of education of any country, during the years between 2010-2015, this number for Bangladesh was only 5.1 which was higher than Pakistan (4.9) but lower than India (5.8). However, Bangladesh was far behind Sri Lanka (10.9) and some of leading Southeast Asian countries like Malaysia (10.1), Thailand (7.7) and Vietnam (7.8). Two important indicators related to the quality of educational infrastructure are "percent share of trained teachers in total teachers in primary education" and "pupil-teacher ratio in primary education". During the years between 2010-2015, in the case of trained teachers, Bangladesh (53 percent) performed very poorly compared to India (77.2 percent), Pakistan (83.7 percent), Sri Lanka (79.1 percent), Malaysia (97.2 percent), Thailand (100 percent) and Vietnam (100 percent). In the case of pupil-teacher ratio, though Bangladesh (39.8) performed better than Pakistan (42.8), it performed worse than India (32.5), Sri Lanka (23.8), Malaysia (11.9), Thailand (16.1) and Vietnam (19.4). Regrettably, Bangladesh is among the bottom in the list of countries in the world with the lowest ratio of public expenditure on education to GDP, which is only 2.1 percent. This ratio is 3.7 percent in India, 5.4 percent in Malaysia, 4.3 percent in Thailand, and 5.3 percent in Vietnam. This is one of the reasons why the private spending on education as a share of household monthly expenditure is much higher in Bangladesh compared to those of other South Asian countries. According to the latest available Household Income and Expenditure Surveys of five South Asian countries, the share of private expenditure on education in the average monthly household expenditure in Bangladesh is around 5.5 percent, 2.6 percent in India, 4.8 percent in Nepal, 2.5 percent in Pakistan, and 1.9 percent in Sri Lanka. This suggests that the responsibility of education expenditure heavily falls on households in Bangladesh, and the government's role is yet to be ideal. BAHAWALPUR: Under the auspices of Punjab Education Foundation, a mobile school was inaugurated in Nawa Kot area of Cholistan desert to impart education to local children. According to a press release issued here on Friday, Chairman, Punjab Education Foundation (PEF), Raja Qamar-ul-Islam inaugurated mobile school in Nawa Kot area of Cholistan desert falling within jurisdiction of tehsil Liaquat Pur. Speaking on the occasion, he said that mobile school would help in spreading education. He said that local children of Cholistan desert who have no access to school would be beneficiary of mobile school system. “PEF is working on agenda of Parha Likha Punjab,” he said. Despite 220,000 schools nationwide, more than 20 million children are not in school, the government said in a 2016 report. Two young boys kneel over small white tables, intently studying the Koran at a madrassa in Pakistan. The Al-Nadwa Madrassa in the hill station of Murree, 30 kilometers from the capital, Islamabad, is part of an established alternative system of education in the South Asian nation. Private schools, charitable institutions and religious seminaries are stepping in to supplement government-run schools to help meet the education needs of an estimated 50 million school-age children. The government has pumped money into schooling, with the education budget swelling by 15% every year since 2010, according to education consultancy Alif Ailaan. The United Nations estimates Pakistan’s current education budget at 2.65% of GDP, roughly $8 billion, or around $150 per student. Private educators say the country’s education problems are not only due to a lack of funds but also inadequate teaching. “It’s not the number of schools, it’s the quality, the attitude,” said Zeba Hussain, founder of the Mashal Schools which teaches children displaced by war in the country’s north. Hussain started the charitable Mashal Schools after she met a group of refugee children while visiting the hill areas surrounding Islamabad. Federal education director Tariq Masood said blaming teachers was unfair. He said population growth and funding were the biggest challenges faced by government schools. Masood said government schools adhered to a nationwide curriculum that was being constantly reworked and improved. “No one who is underqualified can enter the government system. There are fewer checks in the private system,” he said. The country’s poor often send their children to one of the thousands of religious madrassas (the Arabic word for school) where students live and receive Islamic instruction. Most operate without government oversight and some madrassas have been criticized for their hardline teachings of Islam. The madrassas say they provide shelter, three full meals, and a good education to young people whose families are unable to make ends meet. “In certain cases people send their kids because they can’t even afford to feed them,” said Irfan Sher from the Al-Nadwa Madrassa. He said Pakistan’s future hinged on education for its youth. “The overall policy should be changed...they should understand that if they want to change the country the only way is to spread quality education,” he said. A political machine is a political group in which an authoritative boss or small group commands the support of a corps of supporters and businesses (usually campaign workers), who receive rewards for their efforts. The machine's power is based on the ability of the workers to get out the vote for their candidates on election day. Although these elements are common to most political parties and organizations, they are essential to political machines, which rely on hierarchy and rewards for political power, often enforced by a strong party whip structure. Machines sometimes have a political boss, often rely on patronage, the spoils system, "behind-the-scenes" control, and longstanding political ties within the structure of a representative democracy. Machines typically are organized on a permanent basis instead of a single election or event. The term may have a pejorative sense referring to corrupt political machines. The term "political machine" dates back to the 20th century in the United States, where such organizations have existed in some municipalities and states since the 18th century. Similar machines have been described in Latin America, where the system has been called clientelism or political clientelism (after the similar Clientela relationship in the Roman Republic), especially in rural areas, and also in some African states and other emerging democracies, like postcommunist Eastern European countries. Japan's Liberal Democratic Party is often cited as another political machine, maintaining power in suburban and rural areas through its control of farm bureaus and road construction agencies. In Japan, the word jiban (literally "base" or "foundation") is the word used for political machines. More recently, Pakistani policymakers have begun to use these private schools to provide state education. Today Pakistan has one of the largest school-voucher schemes in the world. It has outsourced the running of more government-funded schools than any other developing country. By the end of this year Punjab aims to have placed 10,000 public schools—about the number in all of California—in the hands of entrepreneurs or charities. Although other provinces cannot match the scope and pace of reforms in Punjab, which is home to 53% of Pakistanis, Sindh and Khyber Pakhtunkhwa are implementing some similar changes on a smaller scale. The results are promising—and they hold lessons for reformers in other countries. One is that “public-private partnerships” can improve children’s results while costing the state less than running schools itself. A paper published in August by the World Bank found that a scheme to subsidise local entrepreneurs to open schools in 199 villages increased enrolment of six- to ten-year-olds by 30 percentage points and boosted test scores. Better schools also led parents to encourage their sons to become doctors not security guards, and their daughters to become teachers rather than housewives. Other new research suggests that policymakers can also take simple steps to fix failures in the market for low-cost private schools. For example, providing better information for parents through standardised report cards, and making it easier for entrepreneurs to obtain loans to expand schools, have both been found to lead to a higher quality of education. Another, related lesson is that simply spending more public money is not going to transform classrooms in poor countries. The bulk of spending on public education goes on teachers’ salaries, and if they cannot teach, the money is wasted. A revealing recent study looked at what happened between 2003 and 2007, when Punjab hired teachers on temporary contracts at 35% less pay. It found that the lower wages had no discernible impact on how well teachers taught. Such results reflect what happens when teachers are hired corruptly, rather than for their teaching skills. Yet the final and most important lesson from Pakistan is that politicians can break the link between political patronage and the classroom. Under Shahbaz Sharif, Punjab’s chief minister, the province has hired new teachers on merit, not an official’s say-so. It uses data on enrolment and test scores to hold local officials to account at regular high-stakes meetings. Shifting from “the politics of patronage” to “the politics of performance”, in the words of Sir Michael Barber, a former adviser to the British government who now works with the Punjabis, would transform public services in poor countries. Pakistan’s reforms have a long way to go. But they already have many lessons to teach the world. Less than half of third graders in Pakistan can read a sentence in Urdu or local languages. Thirty-one percent can write a sentence using the word “school” in Urdu, and 11 percent can do it in English. Children in government schools report that teachers have them clean, cook, massage their feet and buy them desserts. Children are categorized as smart or stupid as soon as they start school. Corporal punishment is severe. Parents will send their kids to a private school if they can afford a few dollars a month, but they do not see government schools as worth it. Although aid programs of the United States and Britain contribute a mere 2 percent of the education budget, those countries and the local elite, whose own children go to high-end private schools, have emphasized that Pakistanis demand education and that more children should be enrolled in school. But the demand for education is already high, evidenced by the mushrooming of low-cost private schools that now enroll 40 percent of students in the country and charge as little as $2 a month. A different kind of school in Pakistan is giving poor children, and sometimes their mothers too, a new chance to get an education. The program is called Street to School. Organizers launched it in the Pakistani city of Karachi in 2014. The idea was to create a school for children who played on the streets every day while their parents worked. Some parents chose not to send their children to school, while others did not have enough money to do so. The founder of Street to School is Mohammad Hassan. He says children who spend all day on the streets are at risk for a number of reasons. They are in danger of catching dangerous diseases and can also be caught up in crime and drug use. Others are forced to work. Street to School is a way to keep these children off the streets, while providing them with a basic education and useful life skills. Hassan says the preschool education program centers on reading, writing and mathematics. Students are also taught English as well as the local language, Urdu. In addition, Street to School includes sports activities and provides students with information on how to stay healthy and take care of themselves. Hassan says Street to School has been successful in getting children off the streets and on a new path toward an education in traditional schools. But running the school also taught him about another great need in the community. Uzma is a wife and mother who decided for herself she wanted to join Street to School. Karachi has other educational programs for street children. One of them is called The Street School. Two teenagers, Hasan and Shireen Zafar, started the program. It aims to bring education to the streets for groups of needy children around the city. The program started out with just two students, but grew to more than 200. The Zafars told Dunya News one of their main goals is to prevent people from abusing children as laborers. The Street School also has begun to teach some adults, most of whom are parents of children involved in the program. Teachers who earn high salaries but don’t show up to school. Even if they do, they might not do much once they get there. Students who can’t read basic sentences after three years in a classroom, and drop out altogether by age 9. And ironically, a government that’s doubled its education budget in the last eight years. Pakistan’s education system has been called a “crisis,” and its reforms “frenetic.” The former chief minister of Punjab fired a significant portion of government teachers, and today over 40 percent of the country’s students are enrolled in schools that are either privately run or sustained on philanthropy. With a new government set to come in, led by cricketer-turned-politician Imran Khan, what does that mean for education? Nadia Naviwala is a Global Fellow at The Wilson Center, where she authored a report called, “Pakistan’s Education Crisis: The Real Story.” She is also a senior advisor for The Citizens Foundation, which educates over 200,000 students in philanthropy-supported schools across Pakistan. BRIGHT Magazine caught up with Naviwala about the root causes of Pakistan’s education crisis, the importance of political will in solving it, and the surprisingly minimal role of international donors. BRIGHT Magazine: I read your story in the New York Times about how Pakistan can’t spend its way out of the education crisis. What are the root causes of the education crisis, and why are they not related to money? Nadia Naviwala: Pakistan’s education crisis comes down to a crisis of teaching and learning, which is not something that money can solve. You can look at some of the best education systems in the world, and they are not necessarily the ones that spend the most. Efficiency is also really important. You can even look within Pakistan: The provinces and districts that are spending more are not necessarily the ones that have stronger education systems. Pakistan has doubled its education budget since 2010, but we haven’t seen either the improvement in enrollment or the learning value you’d expect. BRIGHT: Why hasn’t increasing the budget led to better education outcomes? NN: The majority of the education budget, about 85 percent, goes into teachers’ salaries. If your teachers aren’t showing up to school, or if they aren’t doing anything when they get to school, then it really doesn’t make a difference how much money you’re pouring in. No one has quite figured out what to do. Once you get teachers to school, how do you improve learning outcomes for kids? This is the reason for high rates of illiteracy in schools in Pakistan. Two of Pakistan’s four provinces, Punjab and Khyber Pakhtunkhwa (KP), have achieved a few things regarding education reforms. First, they fixed school infrastructure, because Pakistan was — and still is — a place where going to school is dangerous because the facilities are just so dilapidated. Second was making teachers show up to school. The [provincial] governments started sending someone to school every month to make sure the teacher was there, which resulted in teacher absenteeism plummeting. So for the next government, their challenge is adherence, and also taking some of these reforms to other provinces, so we don’t send the country into four completely different directions. We know how to make schools look like schools, we know how to get teachers to show up. There is still this problem of illiteracy rates, and the fact that a child can go to school for 3–5 years and still not be able to read a sentence in Urdu or a local language. Ghost schools, bogus enrolment, absent teachers, out-of-school children — Pakistan’s public-sector school education system is trapped in complicated challenges. Punjab alone has over 52,000 schools, more than 12 million students and close to 400,000 teachers. Around four years ago, the Punjab Information Technology Board (PITB) started rolling out a series of IT systems for monitoring schools, computerising school enrolment and ensuring teacher presence. Our system works on computer tablets, enabling close to 1,300 monitoring officers to randomly visit schools each month and report data about school facilities, teacher presence and student attendance. The data is geo-tagged (using the tablet’s GPS system), and must be submitted from the vicinity of the school to be accepted by our system. The report must also include geo-tagged pictures of the attendance register and the head teacher, as well as a selfie of the monitoring officer, as evidence of the visit. In the last four years, over 1.9 million inspection reports have been uploaded in the system. In a recent study, Alif Ailaan found our monitoring data to be highly correlated (over 93% correlation) with their independent assessments. We make all the monitoring data public in real-time to make the entire exercise fully transparent and enable all stakeholders to hold the government accountable. This data can be viewed by visiting, http://open.punjab.gov.pk/schools/. On our website, besides real-time inspection data of schools, there are comparisons with previous years to track progress and link to the official school census data for a baseline comparison. Moreover, the same system is used to also measure Student Learning Outcomes (SLOs). As part of each school visit, the monitoring officer is mandated to conduct a pop quiz of 7-10 students using another testing application on their tablets. The quiz is generated by automatic test generation software, populated with millions of multiple-choice questions devised to measure 17 students learning outcomes from the government’s official curriculum. Currently focused on grade 3 students to measure their learning and numeracy, over 35 million tablet-based spot tests have been conducted by our monitoring officers, and the data is uploaded in real-time to our system. This learning outcome data is also made public on the same website. Our website enables visitors to compare districts across 17 SLOs and analyse the performance of grade 3 students across Punjab in terms of their basic learning and numeracy. In order to evaluate the intervention, we ran a Randomised Control Trial (RCT) in 60 schools in Punjab. The one-year study, soon to be published in a research paper, produced exceptional results: Math scores of students improved by 120%; Science scores improved by 52%. Overall, the schools in which e-learn was used showed 74% improvement in test scores. The monthly project cost was less than Rs75 per student. Currently, the project is being scaled up to over 800 high schools in Punjab. This equivalent of Pakistan’s own Khan Academy, and its application in classrooms, could become a blueprint to improve teaching standards and learning outcomes throughout the country. Of all the numbers I have run on what determines the outcome of Indian elections, one of the most surprising to me is how little political lift chief ministers get from palpable economic success. Even when their state has been growing faster than 8 per cent-a rate that normally puts an economy in the 'miracle' class-their chances of re-election improve only slightly, from one in three to 50:50. Often, voters in mofussil India do not feel a dramatic lift even from a rate of growth that makes the Mumbai's stock market bubble and the capital elite assume that everyone feels the fizzy good times. Growth helps at the margin, but even spectacular growth is no guarantee of victory - particularly when the rural majority is not feeling the boom. The number more likely to decide the fate of incumbents is inflation, particularly food price inflation. Unlike double-digit GDP growth, the impact of double-digit inflation rarely goes unfelt or unremarked by voters. Often they can recite recent price increases for onions or ghee down to the rupee, because these numbers determine what - or whether - their family eats. High inflation has presaged the fall of leaders from Rajasthan Chief Minister Shekhawat in 1998 to Prime Minister Manmohan Singh in 2014. But deflation can have the same effect. Lately, farmers have told us they planned to vote against their incumbent government out of frustration over depressed crop prices. Local issues often trump national ones, and vary dramatically from state to state. While a prohibition state like Gujarat demands that visitors reveal 'the name of the drunkard' seeking to buy alcohol, Tamil Nadu struggles to wean its alcoholics off booze and its state bureaucracy off alcohol tax revenue. Today the clouds of smog stretching across the subcontinent are a big issue in Delhi, a nonissue in provincial cities and towns, where voters are less focused on air quality than more pressing concerns such as finding a functioning school for their children. Even the national corruption scandals that periodically consume Delhi matter less outside the biggest cities than scandals involving state leaders. Alongside inflation, corruption is the other big incumbent killer, though it works in strange ways. Leaders rarely make it five years without facing some charge of corruption, and many of them can survive so long as the charge doesn't come to dominate the election storyline. But sweeping corruption charges have been contributing to the defeat of leaders at least since Rajiv and the Bofors case, and we have seen scandal help topple Vasundhara Raje on her ties to a flamboyant 'super chief minister', Mayawati on the self-indulgence of her own statues and palaces, and many others. Excerpted with permission of Penguin Random House India from 'Democracy On The Road' by Ruchir Sharma.